Salmon is one of the healthiest fish you can eat. It's rich in the omega-3 fatty acids linked to a decreased risk of high blood cholesterol and cardiovascular disease; a 3-ounce serving may contain as much as 1.9 grams of the heart-healthy fats. It's also low in contaminants such as mercury and polychlorinated biphenyls, or PCBs. The Monterey Bay Aquarium's Seafood Watch recommends choosing farmed freshwater coho salmon or wild-caught Alaskan salmon whenever possible. For the most health benefits, aim to eat 3 1/2 ounces of fatty seafood like salmon at least twice a week. Rinse both sides of the salmon under cool water. Use paper towels to gently dry the fish. Place the salmon, skin side down, in the center of a rectangular sheet of heavy-duty aluminum foil that is large enough to cover the fish completely when the sides are folded up. Use two sheets if necessary. Sprinkle the top of the salmon with herbs, spices or seasonings, such as salt, pepper, minced garlic, thin slices of fresh lemon, rosemary or ginger. Drizzle the salmon evenly with olive or canola oil. Fold the long edges of the aluminum foil up and crimp them together tightly over the top of the salmon. Fold up the excess foil on both edges, forming a sealed packet that completely encases the salmon. Place the foil-wrapped salmon on a rimmed baking sheet. 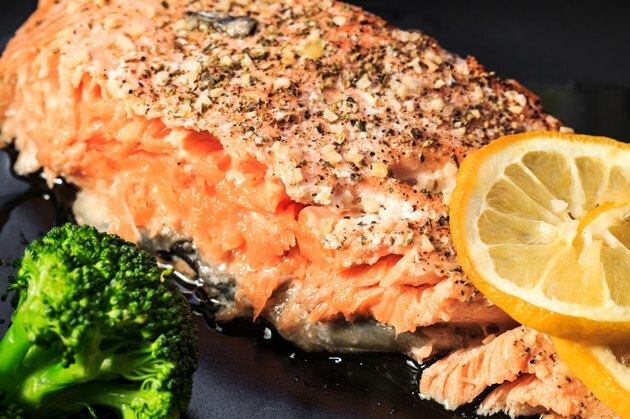 Bake the salmon until it is cooked through, approximately 15 minutes for a 2 1/2- to 3-pound salmon baked at 450 degrees Fahrenheit. Remove the salmon from the oven. Open the top of the foil packet, being careful to avoid the accumulated steam that is released. Insert a cooking thermometer into the thickest part of the fish. Serve the salmon when the thermometer registers 145 degrees Fahrenheit. Bring your grill to medium heat, about 350 to 400 degrees Fahrenheit for gas grills, or until you can hold your hand comfortably 3 inches over the grate for about four to five seconds for charcoal grills. Place the foil-wrapped salmon in the center of the grill. Close the lid. Allow the side of salmon to cook for about 10 minutes. Remove the salmon, open the packet and check the internal temperature of the fish. Rewrap the salmon and return it to the grill for several more minutes if it has not yet reached 145 degrees Fahrenheit. Pregnant or nursing women and young children should limit themselves to 12 ounces of seafood each week.